A great all-around tire for the varying conditions the NW offers. Excellent mud traction yet fast when ran at higher PSI on dryer/frozen days. The tire compound is soft and tacky, which is great for race days, but they will wear quickly if used extensively on the road. I bought this tire for racing cross in Colorado. I have Tufo Primus and Cubus on my other wheels and feel that the PDX is superior to both in any conditions. I used them for dirt, grass, snow, mud, and sand and they worked well in all conditions. Mounted these for the last few CX races of the season. The traction is excellent and they shed mud nicely. Cornering is on par with Dugast and Challenge offerings. My one concern is durablity. The tread compound is soft and, as such, doesn't roll as fast at other tires. In addition, I had a few center tread knobs rip off in a race (unusual), which makes me question if the tires will last a season. Overall, good design; question durability. About the best built tubular i have seen. Handling in the mud is good. The handling is good with a nice feedback and warning that it is going to slip. Traction in mud is good but not as good as my best mud tire, Rocket Ron clinchers, which aren't made in tubular versions until 2013. The build quality is amazingly better than Continental or Vittoria tubulars. The Clements glued on nicely and appear to be well made. With valve extenders properly fitted (I am using them on deep-section FSA tubulars), they hold air quite well, and I've had no issues with them. They are tubeless, and can take Tufo sealant, but I haven't put sealant in them yet. (Not many thorns where I race, in the Pacific NW.) This has not been a problem, and I don't anticipate a need for sealant unless I actually get a flat. I weigh 170 lbs, and have run the front tire as low as 27 psi with no issues. I'm sure a lighter rider could go much lower, I may go lower myself if we get smoother courses later in the season. I tend to be conservative with tire pressures so as to protect those precious carbon rims! The biggest surprise is how well the tires perform in conditions they weren't designed for. As I understand it, they were designed with mud in mind. But I have raced them on hardpack, pavement, singletrack, and the grass crit conditions very popular in Seattle courses. I've found their cornering grip on wet grass to be way better than the Tufo Elites (primarily a mud tire) I'd been using previously. 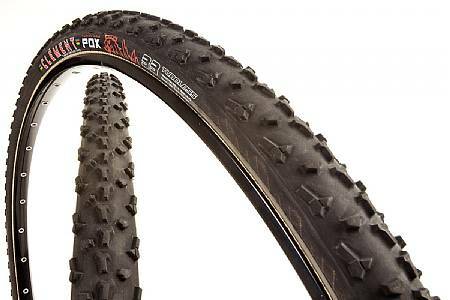 The only other cross tubular I've used is the Tufo Flexus Primus, which is an excellent tire. But the Clements shed mud better than the Tufo, they're a bit lighter, and the ride quality is a bit better, too. I've found the Clement's front end grip to be quite confidence inspiring, and they've never surprised me in sketchy conditions. In a perfect word, it would be great to have a file tread for early season, a mud-specific tire for the end of the season, etc. But if you don't want to mess around with all that, the PDX is a very capable all-condition tire, ad has handled everything I've ridden it through just fine. At the pro level having the perfect tire for the conditions is essential, but if like me you're a cat 3 with a day job, I'm confident these tires won't ever be the thing keeping you off the podium! I hope the 5-star rating doesn't seem excessive, but honestly, I can't think about anything I'd want to change about these tires.